While retailers have long fretted over whether social media sites drive adequate sales, major players in the category seem to have no intention of backing away from Facebook, Twitter and Instagram. But a new study might change their minds. Between January and March, e-commerce vendor Custora crunched data about $100 billion in sales among 500 million shoppers and found that only 1.5 percent of retailers' last-click e-commerce transactions came via social media. Within that sliver of activity, Facebook dominated 81 percent of sales, while shopping-centric Pinterest generated 10.8 percent and Instagram, YouTube and Twitter collectively yielded 5.2 percent. "If you're looking on a last-click basis, there's been no movement in terms of social media platforms. Even the advent of buy buttons has done absolutely nothing to move the needle," said Claude de Jocas, a lead analyst at digital research firm L2. tactics like search, email and affiliate marketing dominated 70 percent of retail transactions in the study, while another 20 percent of sales were simply impulse purchases where marketing had no influence. Long-tail efforts like display ads, text messages and push notifications accounted for the remainder of sales—essentially making social seem dead in the water. Michael Scheiner, vp, marketing and communications at Abercrombie & Fitch, an aggressive user of social media marketing with a largely millennial customer base, didn't appear to be fazed by the numbers. "We're not as concerned about 'Did they see a piece of content and immediately go to the website?' as we are about 'Did they have a good experience with the brand? Was it interesting to them?'" he said. "Of course, there is an aspect of clicking to the site, but it's a smaller percent than other platforms." More than any other reason, social commerce's impact on branding is what's keeping merchants on board. At Macy's, social stats around engagement and awareness are used in targeting consumers with digital ads via other platforms. 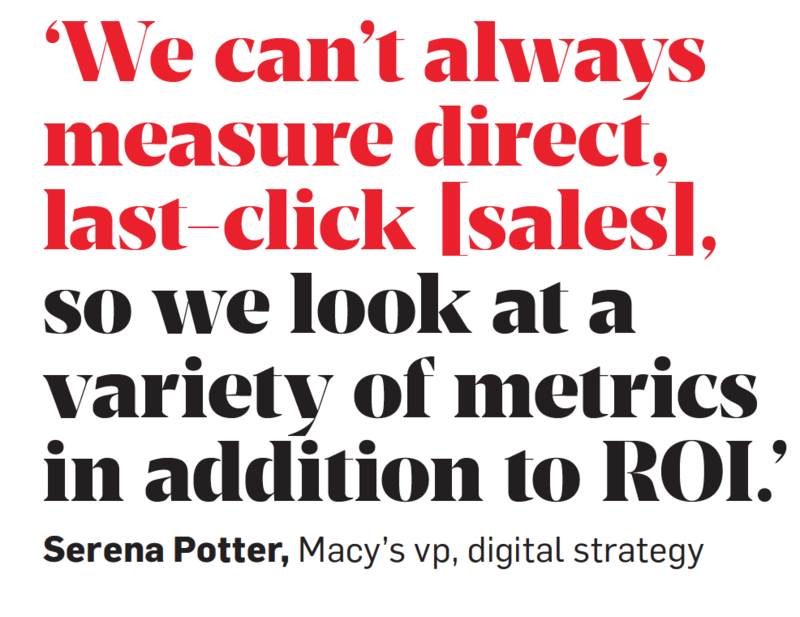 "When we think about social, we can't always measure direct, last-click [sales], so we look at a variety of metrics in addition to ROI," explained Serena Potter, vp, digital strategy. "As we look at the platforms from a customer-behavior perspective, we've really been able to drive traffic to our website, to our mobile experience to create a remarketable audience." 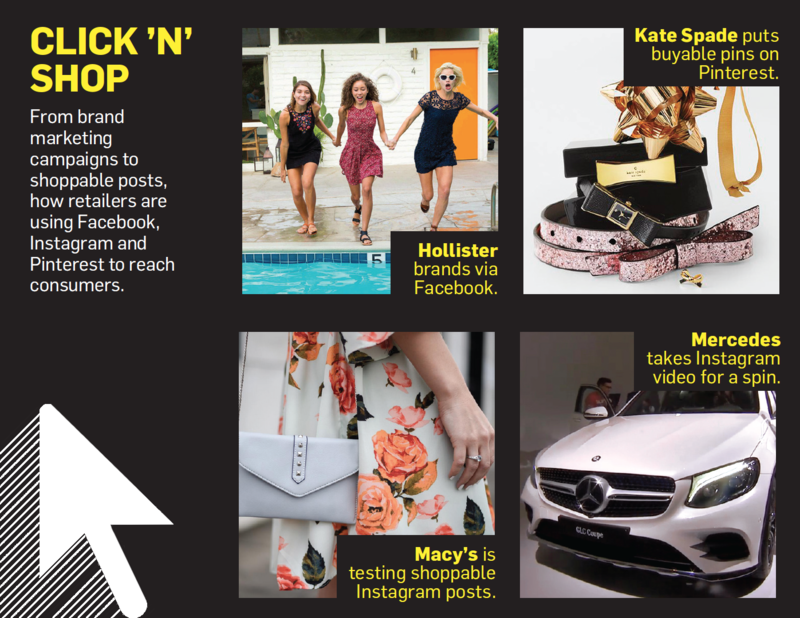 With an algorithm coming to Instagram and Twitter, other retailers could take a cue from Macy's and beef up social budgets with paid ads, making social commerce a harder space for brands to play in, according to L2's de Jocas. Still, in the case of Instagram in particular, Mark Aikman, general manager of marketing services at Mercedes-Benz USA, regularly sees organic posts attract tens of thousands of likes and shares within hours through the creation of dedicated posts for the app, versus simply repurposing Facebook messages, for example. "It's important to create original content and not recycle images and videos," he explained. Aikman said his team approaches Instagram as a branding platform and Facebook as more of a direct-response channel. For example, the automaker's campaign around last month's New York International Auto Show used 15-second clips on Instagram and longer-form video on Facebook. "The buckets are a little different," he said. "I wouldn't try to tell my boss [Instagram] is going to sell cars." Then, there is retail-geared Pinterest and its trove of rich data. Unlike Facebook, Instagram and Twitter, Pinterest is typically used as a research tool consumers turn to for future purchases. Since it debuted buy buttons last June, more than 10,000 merchants have set up more than 60 million "buyable pins." But because the bulk of posts clicked on are saved by consumers for purchases down the road, marketers often have no way of knowing whether particular content drove an immediate sale. But again, marketers seem less concerned about last-click analysis and more focused on long-term effect—which is good news for Pinterest. "People who are pinning are building for the future, whether the future is a baby shower four weeks from now [or] a wedding they're planning four months from now," said Kate Spade & Co. evp and CMO Mary Beech. "It's a marathon, not a sprint."